I played that LP incessantly, and some years later was caught ‘conducting’ it, waving one of my mother’s knitting needles in front of the mirror. Well, I guess there are worse things for teenage boys to be caught doing. That the resulting work is so rich in invention, sound in structure, and sophisticated in craftsmanship says a great deal for the white heat of Jon’s inspiration. The fifty-minute piece broke new ground at the time, and seems only to have grown in stature across the intervening forty or more years. One of the strongest influences on the young Lord was the brilliant maverick British composer Malcolm (later Sir Malcolm) Arnold. The former principal trumpet of the London Philharmonic, Arnold had made his name as a composer of everything from dozens of film scores (Bridge on the River Kwai, Whistle Down the Wind) to a vast output of symphonic and chamber works. His cycle of nine symphonies alone assures him a place among the great British composers of the 20th century. It had been suggested that Arnold might be willing to look over Jon’s nascent score and offer some words of advice. To everyone’s surprise, he did considerably more than that: after examining only a few pages, he immediately offered to conduct the premiere. The strength of Arnold’s spiritual influence has occasionally led some to assume that he had a stronger hand in Jon’s Concerto than merely that of its first interpreter. So let it be said, once and for all, that Lord wrote and orchestrated every note himself. But Arnold’s impact on the first performance cannot be underestimated. Without him, as Jon has always acknowledged, the whole thing would have degenerated very quickly into chaos. As the concert drew closer, with deadlines for delivery of score and parts looming, Jon was under tremendous pressure. The band members themselves were apprehensive, and their nervousness can’t have been much assuaged by a preliminary encounter with the musicians of the Royal Philharmonic Orchestra. Jon remembers being ushered with his bandmates into a rehearsal at Henry Wood Hall in London during the week before the performance. The RPO was hard at work on another project with Rudolf Kempe – not a conductor known for his appreciation of heavy rock, as far as I know. There was an immediate outbreak of wolf-whistling from the besuited (and of course largely male) orchestral musicians to the long-haired and extravagantly dressed young rock stars. This, however, was merely a prelude to the behaviour which was to unfold during two very tense rehearsals the following week. To put this into some context, it’s worth remembering that Deep Purple were not then the legends they were soon to become. To the RPO, they must have appeared something akin to a bunch of gatecrashers at a royal garden party. Rebellion was therefore rife in the ranks. A cellist (one of the few women in the orchestra) was heard to say she had not joined the Royal Philharmonic “to play with a bunch of third-rate Beatles”. Arnold had to go and persuade her back into the rehearsal. Another player took out The Times and started doing the crossword, and yet another sat with his fingers ostentatiously stuck in his ears. But Malcolm’s belief in Jon’s music was unshakeable, and he won most of them over by sheer force of personality, although at one memorable moment crossed a line which no conductor these days would ever dare. After an especially apathetic run-through, the band was amused (and a little shocked) to hear Arnold tell the orchestra that they were playing “like a bunch of cunts”. Ultimately, he led a performance of heroic assurance and boldness, as can be heard on the recording made on that historic night of September 24th 1969. For all the imperfections in the orchestral playing, caused by a combination of under-rehearsal and a residual attitude problem, there is a liveliness and spirit about the whole thing that is still vivid today. The concert opened with Arnold’s Sixth Symphony, by no means a straightforward work to prepare in the short time available, and Deep Purple followed this with a short set of their own, including scorching performances of Child In Time, Wring That Neck and Hush. The concert was billed as “the best of both worlds” and, against all the odds, that’s how it turned out. Undaunted, the band headed to Los Angeles almost a year later for the Concerto’s second, and as it turned out for the moment, final performance in August 1970. This time, Lawrence Foster conducted the LA Philharmonic at the Hollywood Bowl. By all accounts, this was a far less successful affair, with the conductor taking a rather high-handed attitude to Jon’s score and imposing some cuts of his own. Perhaps fortunately, there are no audio or video records of the event. What happened to the Concerto next is still shrouded in mystery. I contacted Jon Lord to ask about the prospect of performing the Concerto again, on what would have been its 25th anniversary. Only then did it begin to emerge that, unbelievably, score and parts had all disappeared after the LA performance. Everything was lost. We tried everyone who’d had anything to do with it: Malcolm Arnold, the archives of the Royal and LA Philharmonics, and the Deep Purple management. Jon scoured his attic. All to no avail. It seemed that the precious material had indeed just disappeared into a Californian black hole. And call he did, just a few hours later, with the exciting news that the Concerto score had been found. Well, not exactly “found”. It soon became clear that something even more extraordinary had happened. A few days later, the composer turned up at my rented flat in London with a huge unbound sheaf of papers under his arm. The story is now well known. The previous year, on tour with Deep Purple, Jon had arrived at a hotel in Rotterdam, tired and road-weary, to be confronted by a young man eager to speak to him. Doing his best to steer clear, keen to get to the safety of his room and the comfort of a pre-gig shower, Jon was stopped in his tracks by the words “I think I’ve recreated your Concerto”. The young man turned out to be a Dutch composer by the name of Marco de Goeij. Knowing of the score’s disappearance, he had somewhat incredibly spent the best part of two years painstakingly transcribing the old recording, as nothing more than a labour of love. The immensity of this task, which had seemed so overwhelming to the composer himself, appeared not to have fazed the extraordinarily devoted Marco for whom no tribute is too fulsome. Quite simply, without him the Concerto would have been lost forever. What he had produced at that stage was, however, far from complete. There were frequent gaps where even he had been unable to decipher Jon’s intentions from the not entirely accurate live performance. But, turning Marco’s pages, Jon and I realised we had everything we needed to begin a thorough restoration of the work. Over a period of several months, we met at Jon’s home near Henley on Thames, sometimes for days at a time. Supplied with copious quantities of manuscript paper, and the old audio and video recordings for guidance, we embarked on a note-by-note, bar-by-bar re-examination of the thirty-year-old composition. It was exhilarating for me to see Jon suddenly remembering the details of what his younger self had written as he lay sprawled on the floor back in 1969. At other times, it flowed less easily and we listened over and over again to the tiniest details of the recording, just as Marco had done, trying out things four-handed at the piano, searching for elusive harmonies. Jon also took the opportunity along the way to revise and re-orchestrate. A few small cuts were made to tighten the structure. I threw in whatever ideas I had, some of which received the composer’s nod of approval, while others were discreetly dropped. By the time we’d already passed a couple of deadlines and the time finally came to commit ourselves, we had virtually carpeted and papered Jon’s home with sheets of scribbled-on, screwed-up and stuck-together pages of full score. Many hours were spent on the phone to Marco back in the Netherlands, as he sat at the computer, resetting the new score and producing the orchestral material. Plans had meanwhile been advancing for the world-premiere performances of the revised Concerto, which were to take place at the Royal Albert Hall, with Deep Purple and the London Symphony Orchestra, together with a stellar cast of guests, on the 25th and 26th of September 1999 – thirty years on, almost to the day, from the original concert. The idea was to combine the Concerto with a variety of pieces reflecting the wide-ranging activities of individual Deep Purple members outside the band. This meant liaising with everyone to determine what they wanted to play, and commissioning arrangements of anything involving the orchestra, including the Purple songs which would bring the show to its climax. Even as I arrived at the Mandarin Oriental Hotel in Knightsbridge on September 19th 1999, at the beginning of the performance week, there was still a huge amount of work to do. My room took on the character of a music library as the process of bringing everything together continued. (At one point, even Roger Glover was on sellotape duties.) I did, however make one fatal mistake: I spent that evening in the hotel bar with Ian Gillan. While nursing my early-morning hangover, Jon arrived bearing a huge box of orchestral parts, which we delivered ourselves to the LSO offices, and the rest of the band began to assemble in a small rehearsal room in Putney, which was to be our home for the next four days. I watched in awe as the chemistry of one of the world’s great rock bands kicked in. Jon coached his colleagues, and I imitated the orchestra on the piano while the little studio played host to our huge cast: Dave LaRue and Van Romaine from the Steve Morse Band, Ian Gillan’s guitarist Steve Morris, the wondrous Sam Brown who broke everyone’s heart the first time she sang through Wait A While, the equally magisterial Miller Anderson, a sensational horn section and team of backing vocalists, and of course the beloved and much-missed force of nature that was Ronnie James Dio. The extremely complex concert was so meticulously rehearsed that by the time we reached the Albert Hall, the atmosphere among us was electrified to the point of incandescence. I will never forget the frisson in the air as the Concerto’s gently pulsating opening bars wafted around the empty Albert Hall thirty years since they had first done so. By contrast with the friction between conductor, band and RPO back in 1969, the LSO of 1999 were there to enjoy themselves. I had been appointed their assistant conductor the previous year, and so we had already established a good working relationship. But their engagement with the spirit of the occasion went far beyond anyone’s expectations. They invigorated our joyously eclectic concert with every fibre of their legendary virtuosity and good grace. Just look at the video to glean the atmosphere – check out the entire double-bass section singing along with Smoke on the Water! Which is not to say it was easy: with a running time of nearly three hours, and only three rehearsals, the pressure was considerable: both sold-out nights would be recorded live, and the second show filmed. But I guess if you are reading this, you won’t need telling what special concerts they were. The audience was a veritable who’s who of Purple fans and friends from all over the world, and I can still feel their warmth scorching the back of my neck. Exhausted, sweaty and half-deafened at the end of the second show, I was in my dressing room when there was a knock on the door. A man stood there holding a rose, and in the confusion of the moment, I didn’t realise who the kindly, soft-spoken visitor was. It was only when he told me his name was George and I almost said “George who?” that I recognised the ex-Beatle. It was all a long way from childhood fantasies, and waving a knitting needle in front of the mirror. I’m no longer sure who was insane enough to suggest touring this massive project. Orchestras are expensive things for all sorts of reasons: they are made up of nearly a hundred musicians, all of whom have to be paid. And unlike the well-oiled machine of a road-tested rock band, they eat up days of rehearsal time, during which both crew and band are kept hanging around on the road, costing but not earning money. But the outstanding Deep Purple ‘team’, manager Bruce Payne, tour manager Colin Hart, and production manager Charlie Lewis, together with a whole host of other talented and hard-working individuals, soon put their minds to solving these problems, and we were able to face the prospect of a massive tour. Taking in more than thirty concerts, in Argentina, Brazil, Mexico City, throughout Europe and later in Japan, this was an immense feat of logistics and sheer hard work for everyone concerned. There were challenges and satisfactions at every turn. After the final concert in Tokyo, on March 25th 2001, Deep Purple and I went our separate ways. The following year, Jon Lord reached one of the toughest decisions of his life, and announced his long-contemplated retirement from the band he had founded, and had loved so much. Post-Deep Purple, released from the daily routine of travelling and performing, Jon’s compositional activity quickly flourished. The Piano Concerto Boom of the Tingling Strings­, whose gestation had begun before his departure from the band, was the first to appear, closely followed by Disguises, a rich and evocative work in three character sketches for string orchestra, dedicated to Malcolm Arnold. (The first movement, a vivid and unflinching portrait of Sir Malcolm in all his temperamental complexity, was published just a few days too late for the ailing composer to see. He died on September 23rd, 2006.) Jon released a wonderful and often unjustly overlooked solo album Beyond The Notes, while other works began firmly to establish his new compositional identity, including the hugely successful Durham Concerto, written to a commission from the University of Durham, and the more personal To Notice Such Things, an elegiac portrait of his dear friend the writer Sir John Mortimer, both of which were recorded by the Royal Liverpool Philharmonic Orchestra. I also recorded Boom of the Tingling Strings and Disguises with the Odense Symphony Orchestra and the pianist Nelson Goerner for EMI. His music found an ever-wider audience, and his credentials as a serious composer were being increasingly recognised around the world. The Concerto for Group and Orchestra, meanwhile, had taken on a life of its own. Now thoroughly road-tested by our tour, the score became available for others to perform. I travelled to Brisbane in February 2002 to conduct the Australian premiere, not with Purple but with a brilliant and sadly short-lived young band called George. Fronted by the hugely talented brother and sister duo Ty and Katie Noonan, they brought a distinctive new sensibility to the piece, so much so that Jon himself came to Australia with me the following year to take part in further performances with them in Sydney and in Perth. The Concerto also became a staple of Jon’s live activity with many other orchestras, conductors, and soloists. For me though, apart from one performance in the 2007 Malcolm Arnold Festival, with the latter-day Royal Philharmonic – in which we also played Arnold’s 6th Symphony just as they had at the 1969 premiere – and a particularly memorable performance at the Usher Hall with students from Stevenson College Edinburgh, and Glasgow’s Royal Scottish Academy, I did not return to the Concerto until the making of this recording. A couple of years ago, over a glass or two around Jon’s kitchen table, the idea arose of taking the Concerto into the studio for the first time. Rather than using a single band, it would be done with different soloists for each movement, emphasizing the nature of the music itself, and above all, it would allow us to revisit the piece together, to see what it had taught us since the heady days of its reconstruction. Taking the score off the shelf again, I was struck by how my relationship with it seemed to have deepened still further. The desire to perform it again returned with a renewed intensity. After another wholesale revision, incorporating the many detailed refinements of instrumentation that Jon had made during his performances in the intervening years, the recording was set to go ahead with the Royal Liverpool Philharmonic Orchestra, which had already performed much of Jon’s music, and whose enthusiasm for it was palpable. 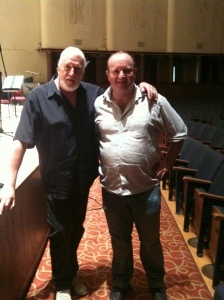 The sessions took place at the orchestra’s home, Philharmonic Hall in Liverpool, on June 1-2, 2011, with only three of the soloists, Jon Lord, bassist Guy Pratt and drummer Brett Morgan in place. The guitars and vocals were added in a series of overdubbing sessions at Abbey Road Studios in London during the following months. So here we are. What you are holding in your hands is as close to a definitive version of this unique work that we’re ever likely to be able to offer. With the participation of the composer and a whole host of rock luminaries – not to mention everything the piece has meant to me since the age of seven – the Concerto for Group and Orchestra has finally come of age, to take its rightful place among the more heterogeneous classics of twentieth-century music. The Concerto is cast in three movements, over the course of which an evolving drama can be traced between the monolithic orchestra and its unruly guests. Retaining at least some aspects of traditional form, it opens with a long orchestral tutti, which might be heard as a kind of diary of the young Jon’s favourite symphonic works. There are, for example, echoes of Sibelius’ First Symphony in the lonely clarinet solo of the opening bars, and of Tchaikovsky’s Fourth in a pizzicato episode near the beginning. But there is also a syncopated swing in the music which identifies the voice as Jon’s own, and he retains a tight control over his material, deploying it with a logic and economy which is genuinely ‘symphonic’. The orchestra again attempts to wrest control, this time deploying heroic horns (and a very explicit reference to Holst’s Jupiter.) Increasingly un-intimidated, the band now proceeds to show off their Hammond organ player. As his solo begins to wind down, the orchestra begins muttering to itself, provoking a vertiginous crescendo and a solo cadenza for the guitar. A nervous low rumble in the basses and timpani leads to a shortened recapitulation and climactic standoff in which band and orchestra exchange power chords at full force. When the dust clears, the same cheeky clarinet that had provoked the band’s first entrance now indulges in a solo cadenza of his own, as if parodying the guitarist. (For our 1999 performances, the LSO principal clarinet asked Jon if he could also do a bit of improvising, and the spectacular result can be heard on the live recording, together with an appreciative ‘shuffle’ from his colleagues. On our new version, we revert to Jon’s original notated cadenza.) This culminates in a frenetic coda, a battle of wills in which the outcome is a draw. In the final moments, the equally matched protagonists hammer out a sequence of unison chords, bringing the movement roaring to its confrontational conclusion. By greatest possible contrast, the second movement begins in a mood of almost Russian bleakness, with a softly treading bass line, tolling bells, cold violin harmonics, and keening bassoons. First the flutes and then a cor anglais sing plaintively over a background of Sibelian string tremolandi. The band, sitting quietly through all of this, gently join in, as if realising that the orchestra is suggesting a whole new range of colours they might use. Ushered in by a short and striking reference to Dvorak’s New World Symphony, the Hammond organ and solo guitar softly blend with the woodwinds. The music soon fractures into a sort of stylised 5/8 dance, taken up in turn by the band. How can I see when the light has gone out? How can I hear when you speak so silently? What shall I do when they stand smiling at me? How will I know when to start singing my song? What shall I do if it all goes wrong? After the blues has played itself out, a brass fanfare introduces the Hammond cadenza, which in turn leads to the Concerto’s most intensely personal episode: a string quartet takes up the organist’s final chords as if they have been listening intently to him all along. (It was no doubt here that some early critics identified a resemblance to Vaughan Williams’ Fantasia on a Theme of Thomas Tallis – indebted it may be, but pastiche it is not.) As the massed strings make their hushed final commentary on their quartet colleagues – marked “barely audible” in the score – and the violas intone a threnody of Shostakovich-like desolation, the movement comes to its forlorn and deeply touching conclusion. After this desolate landscape, the finale comes as a blast of renewed energy. In Jon’s one serious departure from classical norms, it does not return to the original tonality of G minor, but retains the key of E Minor in which the second movement had ended. Only the most curmudgeonly of pedants would hold that against the young composer though, since the music is a remarkable tour de force of sustained forward momentum. Replacing the conflicts of the first movement with a shared ‘concerted’ effort, band and orchestra engage in an exhilarating exchange of ideas as if provoking, inspiring and emboldening one another. After the brassy opening flourish, in which the spirit of Malcolm Arnold is especially strongly present, the strings set up a rhythm which turns out to be one of the Concerto’s in-jokes, being a string orchestra version of a drummer’s paradiddle. Over this, the horns heroically intone the movement’s main theme. Perhaps it was this that led Arnold to suggest doubling the horns in the original performance, with the result that in our LSO revival, and throughout the tour, we continued to use eight rather than the standard four horns. Only in our new recording has this somewhat extravagant gesture been abandoned. The four Liverpool horns are heroic enough. As if provoked by the activities of the orchestra’s percussion section, the band’s drummer flexes his muscles, closely followed by the bass guitarist, leading to a gentle exchange of melodies between the solo guitar and Hammond organ, with the strings warmly and appreciatively accompanying the band. After a final exuberant unison “whoop” from the horns (another nod to a favourite Arnold gesture) and the concluding crashing off-beat chord, it is clear that from a position of inherent incompatibility and conflict, group and orchestra have not only learnt to make music together: they have empowered one another in the process. And that’s as good a summary as any of my experience of conducting this unique and extraordinary work. Without making any pretentious statements about “the relationship between rock and classical music” (there isn’t one), or “bringing a new audience to classical music” (the one it has seems to be doing just fine, thanks – and anyway no-one talks about bringing a new audience to rock…), we made music in the place where the best of both worlds meet. 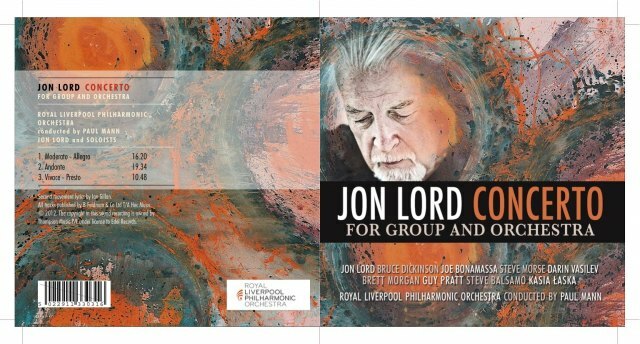 That was all Jon Lord intended back in 1969, and it is this, along with the appeal of the score itself, which assures the Concerto for Group and Orchestra its place in the repertoire. A technical note on this recording. As indicated above, a decision was taken very early in the production process to record the orchestra with only organ, bass and drums playing live. This afforded us the freedom to handpick a cast of guitar and vocal soloists that would have been impossible to assemble at any one time. The orchestra sessions took place at Philharmonic Hall, Liverpool, UK, on June 1st and 2nd, 2011, and were followed by two days of overdubbing at Abbey Road Studios, London; on August 13th 2011 (with Jon Lord and Bruce Dickinson), and on October 20th 2011 (with Kasia Laska, Steve Balsamo, and Joe Bonamassa.) On 9 May 2012, Steve Morse took a few hours off from working on the new Deep Purple album in Germany to revisit the finale, and Darin Vasiliev added his guitar to the first movement in Sofia. Mixing took place at Abbey Road with the brilliant Andrew Dudman over two days in late May 2012, supervised by the composer and myself. The result is a far greater degree of clarity and balance than was ever possible live, finally allowing us to hear the piece as Jon must have heard it in his imagination, back in 1969. This entry was posted in About Brendan Ball, The Tour Blogs & Brendan's Solo Blogs and tagged "Deep Purple", "Jon Lord", "Royal Liverpool Philharmonic Orchestra", 'Brendan Ball', 'RLPO', Bruce Dickinson, Concerto for Group and Orchestra, Ian Gillan, Paul Mann. Bookmark the permalink.